The door to the U.S. Senate may have just closed on Geoffrey Diehl, but the former state representative says he is now searching for his window to the next opportunity. Statewide, Warren held a 60-36 margin of victory over Diehl based on unofficial results with Independent Shiva Ayyadurai taking about 3 percent of the votes cast. 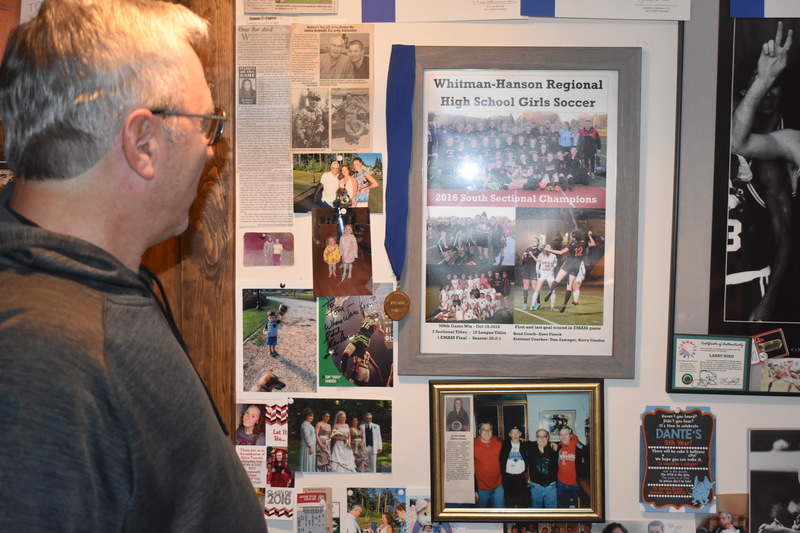 Locally, the picture was a mirror image for Warren and Diehl, as the Whitman Republican took his hometown of Whitman by a 3,888 to 2,641 margin of 6,776 votes cast. Hanson voters went for Diehl by a larger margin — 3,104 to 1,909 for Warren. Ayyadurai garnered 175 votes in Whitman and 124 in Hanson. Hanson also narrowly voted to support two town ballot questions — 2,641 Yes to 2,354 No on Question 1 and 2,630 Yes to 2,357 No on Question 2 — that prohibit retail cannabis businesses in town. Diehl’s strongest bases of support were on the South Shore, central Worcester County and towns southwest of Springfield. Diehl said he was very glad to have the chance to debate incumbent U.S. Sen. Elizabeth Warren, D-Mass., and talk about the issues. Warren, making her victory speech after 11 p.m. in Boston vowed to do just that, as well as to continue fighting to empower women. Warren lauded Diehl for “stepping up” and taking on the hard and expensive task of running for office, thanking him for his efforts along with all others who campaigned for office or supported one. Diehl addressed his supporters in a short, gracious concession speech shortly before 9 p.m., Tuesday, Nov. 6. His race had been called as a victory for Warren shortly after polls closed at 8 p.m. — first by the Associated Press and then by other news outlets including CBS. It had been a long day of traveling around the state for last-minute meet-and-greets with voters. Whitman supported Gov. Charlie Baker and Lt. Gov. Karyn Polito 5,031 to 1,457 for the Democratic ticket of Jay Gonzalez and Quentin Palfrey. Hanson backed Baker/Polito 3,949 to 1,003 for Gonzalez/Palfrey. Attorney General Maura Healy won both towns, with a 3,897 to 2,699 margin over Republican James McMahon III in Whitman and by a close 2,756 to 2,287 in Hanson. Secretary of State Bill Galvin received 4,233 votes in Whitman and 3,071 in Hanson to Republican Anthony Amore’s 2,065 in Whitman and 1,820 in Hanson. Green Rainbow candidate Juan Sanchez Jr. got 178 votes in Whitman and 104 in Hanson. Treasurer Deborah Goldberg garnered 3,639 in Whitman and 2,620 in Hanson to Republican Keiko Orral’s 2,566 in Whitman and 2,186 in Hanson with Green Rainbow candidate Jamie Guerin getting 102 Hanson votes and 183 in Whitman. Auditor Suzanne Bump held off three rivals, and gained 3,485 votes in Whitman and 2,430 in Hanson with Republican Helen Brady a close second with 2,592 in Whitman and 2,272 in Hanson. Libertarian Daniel Fishman received 212 Whitman votes and 167 in Hanson while Green Rainbow candidate Edward Stamas took 104 votes in Whitman and 60 in Hanson. Whitman’s Congressman Stephen Lynch, running unopposed, received 5,206 votes in Whitman. Hanson gave U.S. Rep. Bill Keating, D-Mass., fewer votes — 2,470 — than his Republican challenger Peter Tedeschi received — 2,536 — but Keating took the win by a 20-percent margin in the district. Governor’s Councilor Christopher Iannella won a handy re-election with 4,871 votes in Whitman and 3,547 in Hanson against a handful of write-in votes. State House races were won locally by Abington’s Alyson Sullivan in the 7th Plymouth District [see related story], taking Whitman with 3,757 votes to Democrat Alex Bezanson’s 2,753. Hanson state Rep. Josh Cutler, D-Duxbury, was unchallenged in the 6th Plymouth District, taking 3,823 of the votes cast. State Sen. Mike Brady, D-Brockton, was also re-elected, taking Whitman with 3,698 votes to Republican Scott Hall’s 2,719 and Hanson by 2,656 to Hall’s 2,230. Plymouth District Attorney Timothy Cruz won re-election with the help of 4,111 votes to Democrat John Bradley Jr.’s 2,425 in Whitman and with 3,331 to Bradley’s 1,656 in Hanson. Robert Creedon, running unopposed for Plymouth County Clerk of Courts got 4,965 in Whitman and 3,619 in Hanson. Also running unopposed, Registrar of Deeds John Buckley Jr., tallied 3,612 in Hanson and 4,984 in Whitman. Unchallenged County Commissioner Sandra Wright won 3,782 Hanson votes and 4,911 in Whitman. Only state Ballot Question 1 on nursing staffing went down to defeat — by a 2-to-1 margin statewide and with 3,720 No votes to 1,397 Yes in Hanson and 4,833 No votes to 1,759 Yes in Whitman. State Question 2, seeking a U.S. Constitution amendment to limit the influence of corporate money in elections won by a 71-percent to 29-percent margin — with 4,270 Yes votes to 2,301 No in Whitman and 3,173 Yes to 1,811 No in Hanson. State Question 3, to continue protections of transgender rights won with a state margin of about 68 percent to 32 percent, and with 3,734 voting Yes to 2,906 voting No in Whitman and 2,803 voting Yes to 2,285 voting No in Hanson. The Senate race result, and the fast call was met with anger and disbelief by Diehl supporters, including Whitman School Committee member Fred Small. “How can they call it so fast?” he demanded. Former sports broadcaster John Dennis, who has become a fixture at Diehl campaign events, also expressed disappointment in the results as he introduced Diehl. But looking on the bright side, Dennis said he made a valuable lifelong friend in the process, introducing Diehl. Earlier in the day, Small and fellow School Committee member Dan Cullity had predicted a Diehl win that would shock the nation. Cullity said he saw another Scott Brown surprise, saying polls are rigged and can’t be believed, and said he viewed the Senate election as more of a referendum on Warren than Trump. “In this area, nobody likes Trump except for crazy people like me,” he said with a laugh. Diehl’s father in-law, Joe Boss, and his friend Paul Brown had also expressed confidence in the day’s outcome. Cullity and Small had the same experiences with their talks across the state with Democrats they knew and with whom they worked. Supporters of Democratic candidates were equally certain of their chances, although Whitman Selectman Randy LaMattina conceded that state Rep. Candidate Alex Bezanson faced a tough opponent in the eventual winner Alyson Sullivan. He said early voting and people’s realization of the importance of the election would negate any effect a rainy forecast would have on turnout. Whitman resident Randy Hill echoed voter trends across the country, citing health care and Trump’s policies and divisive speech. Cameron Thomas, 11, who held a Bezanson sign at the polls, meanwhile said he just plain liked his candidate. While Question 1 on patient limits was trounced 70 to 30 percent at the polls, Hanson nurse Kathy Sussky spent time in the morning holding a “Yes on 1” sign and talking to voters. The similarity in lawn sign design was an indication of that, she said, indicating she saw a tight 50-50 race on the question. “Nurses will never turn away patients,” she said. When voters go to the polls Tuesday, Nov. 6 — if they haven’t already done so under early voting provisions — the state ballot they’ll see is a lengthy one, featuring candidates in 14 races and three ballot questions. Hanson voters, meanwhile, will see a separate town election ballot with two more questions to determine whether the town will permit recreational cannabis retailers in town. Polls on Election Day are open from 7 a.m. to 8 p.m. Hanson voters cast ballots at Hanson Middle School for all precincts. Whitman voters cast ballots at the Town Hall Auditoriums for all precincts. The two Hanson cannabis questions entail changes to both the General Bylaws and Zoning Bylaws, both of which require a “yes” vote to block retail cannabis businesses in the town. Whitman voters have already prohibited such sales in their town. Hanson’s town ballot question 1 pertains to the General Bylaws and question 2 involves the Zoning Bylaws. Voters at special Town Meeting Monday, Oct. 1 narrowly approved an article amending the General Bylaws in order to prohibit the retail sale of recreational cannabis products, but failed to achieve the two-thirds majority required by a second article to amend the town’s Zoning Bylaws. Both will also appear on the Nov. 6 town ballot, but the zoning question is effectively moot — leaving the town to depend on a bylaw approved in May restricting retail marijuana businesses to an overlay district with frontage on Route 27, Main Street and Franklin Street. Opponents of retail cannabis shops cite the potential for adverse effects of marijuana use on teenagers. “Dr. Ruth Potee, M.D., of Greenfield, recently told an audience in Shrewsbury that last year, for the first time, marijuana use among teens surpassed cigarette use. And that’s a problem because early exposure to cannabis, as with early exposure to other drugs, can harm the developing brain,” the Rev. Peter Smith, recently wrote, quoting a story in the Milford Daily News. Smith is a member of W-H WILL. While proponents countered at the Oct. 1 Town Meeting that putting “another liquor store on the corner it doesn’t make you an alcoholic,” others are not convinced by that argument. “We need to realize that marijuana and alcohol are not the same thing nor do they affect the body in the same way,” stated Hanson resident Ken Duty of County Road, citing a recent fatal East Bridgewater crash in which the 18-year-old driver was charged with driving under the influence of marijuana — in a crash that killed four other teens. Duty asks what voters would say to the parents of those killed. “Do you say I voted and welcomed Pot and Edibles to be sold in Hanson? Not me, I want deniability saying I voted to stop marijuana sales in Hanson,” he said. Patrick Powers of Holmes Street reported, during the Town Meeting, that health department reports in Colorado and Washington both found that marijuana use actually decreased among youth in grades six through 12 after legalization as well as a 6.5 decrease in opioid overdose deaths. He also said children are not allowed in cannabis shops where customers must show ID to enter and wait in a waiting room before they are assisted by a certified employee who has passed background checks. Topping the State Ballot is the race for U.S. Senator, with incumbent Elizabeth Warren, D-Mass., facing state Rep. Geoff Diehl, R-Whitman, and Independent candidate Shiva Ayyadurai of Belmont. Republican incumbent Gov. Charlie Baker and Lt. Gov. Karyn Polito are being challenged by Democratic challengers Jay Gonzalez, a former Secretary of Administration and Finance under Deval Patrick, and his running mate for lieutenant governor, Quentin Palfrey who served in the White House under President Obama as a senior advisor for jobs and competitiveness, and as a deputy general counsel in the U.S. Department of Commerce. Incumbent Attorney General Maura Healey, a Democrat, is facing a challenge from Republican James R. McMahon III of Bourne. Secretary of State William Galvin, a Democrat, is being challenged by Republican Anthony M. Amore of Swampscott, and Green-Rainbow candidate Juan G. Sanchez Jr., of Holyoke. Democratic state Treasurer Deborah B. Goldberg, the incumbent, is on the ballot with Republican candidate Keiko M. Orrall of Lakeville and Green-Rainbow candidate Jamie M. Guerin of Northampton. For state Auditor, Democratic incumbent Suzanne M. Bump faces Republican Helen Brady of Concord, Libertarian Daniel Fishman of Beverly and Green-Rainbow candidate Edward J. Stamas of Northampton. Both 8th District U.S. Rep. Stephen F. Lynch, D-Mass., and Governor’s Councillor Christopher A. Iannalla Jr., are unchallenged on the ballot, save for write-in candidate for Governor’s Councillor Erin Johnson. In the 9th congressional district, Hanson voters will see incumbent Bill Keating, D-Mass., is challenged by Republican Peter D. Tedeschi of Marshfield. Incumbent state Sen. Michael D. Brady, D-Brockton, is being challenged by Republican Scott Hall of Brockton. Brady is currently seeking re-election for his third term for the district, which represents Plympton, Halifax, Hanson, Whitman, Brockton, and parts of East Bridgewater and Easton. Prior to becoming a senator, he served four terms as State Representative in the Ninth Plymouth District. As chairman of the Senate Committee on Revenue where he has worked to provide funding for the district for education, public safety, infrastructure, seniors and veterans, according to a statement from Brady’s campaign. Hanson state Rep. Josh Cutler, D-Duxbury in the 6th Plymouth District, is unopposed for re-election. In Whitman, seeking the seat vacated by Diehl in the 7th Plymouth District, candidates Alex Bezanson, a Democrat, and Alyson Sullivan, a Republican are on the ballot. Both are Abington residents in a district that includes all of Whitman and Abington and precincts 2, 3 and 4 in East Bridgewater. Bezanson and Sullivan met in a WATD political forum broadcast on Whitman-Hanson Community Access TV on Monday, Oct. 8. A Quincy native, Bezanson moved to Abington in 1987 and owns a contracting business. He has served on the Abington Conservation Commission, Water Commission and Board of Selectmen. He and his wife founded the HUG Foundation that aids families facing medical issues and the Abington Substance Awareness Coalition as a resource for families of addicts and to promote awareness of the problem for students and parents. Sullivan, a lifelong resident of Abington, and a law student in her final year at the Suffolk University School of Law, has worked as a legal assistant in the U.S. Immigration Court before joining the U.S. Attorney’s Office for the Massachusetts District in its victim/witness unit. She is currently a legal assistant in the state’s Executive Office of Administration and Finance. The WATD debate touched of issues of climate change and the need for renewable energy — which both supported, the importance of municipal experience in the State House; 40B affordable housing issues; business development and challenges to it, public transportation needs; ballot question 2 limiting corporate contributions to political campaigns — which Sullivan opposes as a free speech issue and Bezanson supports, but concedes is not germane to local races; use of state surplus and criminal justice reform. The debate is posted on the WHCA-TV YouTube channel for streaming. Incumbent DA Timothy Cruz, a Republican, is facing a challenge from Democrat John E. Bradley Jr., of Plymouth. Other unchallenged candidates on the ballot are: Democrat Robert S. Creedon Jr., for Plymouth County Clerk of Courts; Democrat John R. Buckley Jr., of Brockton for Register of Deeds and Republican Sandra M. Wright for County Commissioner. Question 1, regarding whether or not limits should be placed on the number of patients that could be assigned to one registered nurse, has received the most attention. Question 2 would create a citizens commission to promote an amendment to the U.S. Constitution limiting the influence of money in elections and reversing a Supreme Court ruling that corporations have the same rights as human beings. A yes vote supports such an effort. A no vote would not create such a commission. Question 3 adds gender identity to the list of prohibited grounds for discrimination in places of public accommodation, resort or amusement. A yes vote retains the current law, which prohibits discrimination on the basis of gender identity. A no vote would repeal that protection under the public accommodation law. WHITMAN — Fire Chief Timothy Grenno and town IT Director Joshua MacNeil announced at the Tuesday, Oct. 23 Selectmen’s meeting that Whitman has received a $199,601 state Community Compact IT Grant. The funds will enable the town to make improvements to radio communication infrastructure to improve coverage for police and fire operations. Selectmen and Planning Board members also met jointly and voted to appoint Elaine Bergeron and Adam Somerville to the Planning Board to fill vacancies. Both terms expire May 18. The Planning Board will keep résumés of candidates Adele Carew and Jerry Blumenthal on file in case another vacancy crops up. All four were encouraged to run for office in the next Town Election. Grenno and MacNeil, reporting on the communications grant, said Whitman was among 44 communities receiving the funds for Fiscal 2019 — and was awarded the most cash on the list. “When it gets into public safety, the fire and police departments’ communication systems are pretty much their lifeline,” Grenno said. Last year he and Police Chief Scott Benton sat down with MacNeil and Town Administrator Frank Lynam to assess the communications infrastructure in town and submitted an article to the Finance Committee to replace the radio systems and network. The Community Compact IT Grant provides $2 million to eligible communities with a cap of $200,000 per project, according to MacNeil. “We’re always looking for ways that we can do better and provide what we can for the community at little to no cost and this is a great example,” he said, noting that a small portion of the work would still need to be added later. But the main goal was to provide full coverage to Whitman Middle School and WHRHS. “Those two buildings have some deficiencies that are problematic and, unfortunately, public safety — when they’re trying to communicate — receiving communications in those buildings is very difficult at times and has interrupted communications on different incidents,” MacNeil said. Grenno also reported that concerns voiced on gas leaks reported at the intersection of routes 18 and 14. He said there have been two or three Grade One leaks since the National Grid lockout started four months ago, but he has not seen any effect on response time to major problems despite the labor dispute. The interviews with Planning Board candidates were among the first orders of business before Selectmen Tuesday. Somerville received seven votes, and on a second ballot between Bergeron and Blumenthal — Bergeron then garnered six votes. The new members were then sworn in by Town Clerk Dawn Varley, so they could attend the evening’s Planning Board meeting. Somerville, has been a gas company sub for 25 years with experience in underground utilities including water and electric as well as gas. He also has construction experience and had owned his own residential building company for about eight years. “As long as I know a couple of days ahead of time, I could be anywhere at any time,” he said of his availability for meetings. Bergeron, who interviewed with both boards Sept. 24, has served on the Finance Committee in the 1970s and has been a member of the Whitman-Hanson Scholarship Foundation for almost 40 years as well as serving as an election worker. She is currently a senior vice president director of personal insurance, overseeing a staff of 60 both directly and indirectly, for a large insurance agency. Among her duties are figuring out what houses are worth and how they should be insured. Blumenthal had to leave the Sept. 24 meeting early, due to a family emergency, and Somerville interviewed this week. He is also a former Finance Committee member. A civil engineer on municipal transportation projects as well as for state and private colleges and universities Blumenthal has been a resident engineer for the Division of Capital Asset Management and Maintenance, and is retiring next week. He had also served on the School Building Committee that worked on WHRHS, but has limited experience in residential development. HANSON — The Board of Selectmen on Tuesday, Oct. 16 heard assurances from Columbia Gas of Massachusetts officials that, once a work moratorium ends on Dec. 1, it will continue in a safe manner. “Help us make people in Hanson feel safe that you guys are going to be doing work here,” said Selectman Laura FitzGerald-Kemmett. Whitman’s Board of Selectmen meeting the same night was canceled due to a posting issue. That board will meet at 7 p.m., Tuesday, Oct. 23. Columbia’s Director of Governmental Affairs from the Westboro corporate offices Michael F. Kane and Field Engineer Nick Wilson out of the Brockton Division briefed Hanson Selectmen at the board’s request. “We’re more interested in you guys’ assuring us that current gas project you’re working on at Whitman and Winter streets [is safe] — that’s been the kind of question that’s been asked by different residents,” Selectmen Chairman Kenny Mitchell said. “We just want to make sure that you’re going to be putting protocols in place in our project that are going to prevent any type of catastrophic situation like there was in Lawrence and Andover,” FitzGerald-Kemmett said. Kane said he could not go into detail about the investigation still being conducted by the National Transportation Safety Board (NTSB), despite the release of a preliminary report from that agency. “There’s still more investigation that goes into it,” Kane said. “They’ve asked us not to talk about any more of the investigation” What he did outline was the difference between the companies divisions and the work they do. FitzGerald-Kemmett asked if the contractor is, indeed, the same as was involved in work in the Merrimack Valley when last month’s explosions and fires occurred. Kane and Wilson confirmed that. Contractors must meet the same qualifications as Columbia Gas employees, Kane stressed. Selectmen Wes Blauss noted the Dec. 1 moratorium deadline was in place, but asked where the project stood in general. Wilson said safety measures in place in Hanson include an underground regulator pit that is being brought above ground and replacing the two-regulator runs with a three-run station. Once the work is done, it will be run parallel to the existing system for a while until safety tests are completed, according to Wilson. While most of the piping in the street is done, he said that there are additional excavations needed to “liven those gas lines up” after the moratorium is lifted, but most of the remaining work will be in the station itself and a building constructed over it. In other business, Whitman-Hanson Community Access TV Executive Director Eric Dresser presented an update to the board, including progress in the investigation of a vandalism that damaged the sign at the Whitman office this month. He said anyone who helped share security camera footage they posted online was instrumental in helping resolve that crime. Dresser reported that fiber-optic transmission has improved the quality of video broadcast from meetings and other events. They have also installed new windows and security cameras while bringing their edit lab online. He also brought in letters of support he hoped Selectmen would sign onto to prevent franchise competition resulting from new 5G hardware, which can be posted on utility poles, competing unfairly with their funding source. The other legislation of concern would permit cable companies to seek charge-backs to local access channels for what they consider in-kind services. Selectmen also approved a request from Melissa Valachovic on behalf of the Hanson PTO to receive a reduced fee for use of Needles Lodge and Cranberry Cove at Camp Kiwanee for a Polar Plunge fundraiser on Sunday, Jan. 27. She shared the idea with the PTO and town department heads over the summer and, after some initial doubts, all of the groups came on board. Safety, traffic and potential snow removal concerns were also discussed with public safety personnel as well as school officials. Participants will be registered online and will be asked to line up sponsors. “If you can get [Selectman] Jim Hickey to sign up and jump in, you’ve got my support” Mitchell joked. Valachovic said she did hope some town officials or prominent citizens would sign up to support and participate in the project. “Are you telling me right now you’re going to get me to go in, or would you rather do it in private, Mr. Chairman?” Hickey asked. “We’ll do it in private,” Mitchell said. Valachovic said Jan. 27 was picked because it was NFL Pro Bowl day “which nobody watches anyway,” but cautioned a weather delay would mean rescheduling it to Super Bowl Sunday, Feb. 3. “But it’s in the morning, so you can [do the] jump, get warm and then be ready to enjoy the game,” she said. If the pond is frozen over, she has already lined up the Fire and Highway departments to cut through the ice along the beach area.